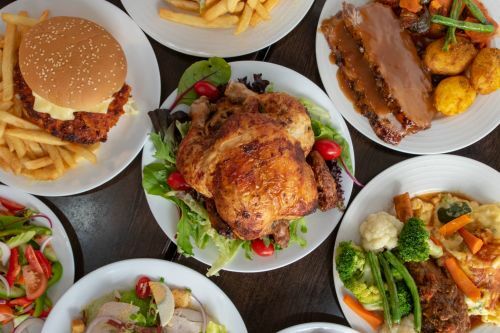 Menulog delivers for Spit Roast - Gymea so you'll be able to track your courier on a map. With the scope of vegetables or salad, chips and can of drink. Combo includes chips and can of drink. Quarter of roast chicken with lettuce and mayonnaise. Served with 1 x vegetables or salad and gravy. Served with two vegetables or salad and gravy. Served with 2 x vegetables or salad and gravy. With a choice of 3 x vegetables salad or gravy. Served with 2 x vegetables or salad of your choice and gravy. Served with 3 x vegetables or salad of your choice and gravy. Extra Large = Seasoned Chicken. Lettuce, tomato, beetroot and caramelised onion. Lettuce, tomato, beetroot, cheese, caramelised onion and BBQ sauce. Lettuce, tomato, caramelised onion, beetroot, cheese and tomato sauce. Lettuce, caramelised onion, cheese, hot chilli and tomato sauce. Lettuce, caramelised onion, cheese, mustard and BBQ sauce. 2 x Beef patties, lettuce, caramelised onion, cheese and tomato or BBQ sauce. Egg, bacon, cheese, lettuce, tomato, beetroot, onion and tomato sauce. Grilled chicken fillet with lettuce and mayonnaise. Lettuce, mayonnaise and special chilli sauce. Lettuce, mayonnaise, tomato, cheese and sweet chilli. Lettuce, mayonnaise, fresh tomato and avocado. Lettuce, mayonnaise, tomato, pineapple and cheese. Lettuce, mayonnaise and chilli sauce.